Corned Beef Hash - Well not yet! - Canning Homemade! Home » Meat » Corned Beef Hash - Well not yet! Corned Beef Hash - Well not yet! I was inspired again by the sheer ingeniousness of my friend Miranda. Randie as many call her came up with an Irish inspired idea of canning Corned Beef. Not just any Corned Beef but the idea of creating a jar specifically for the use of making Hash. 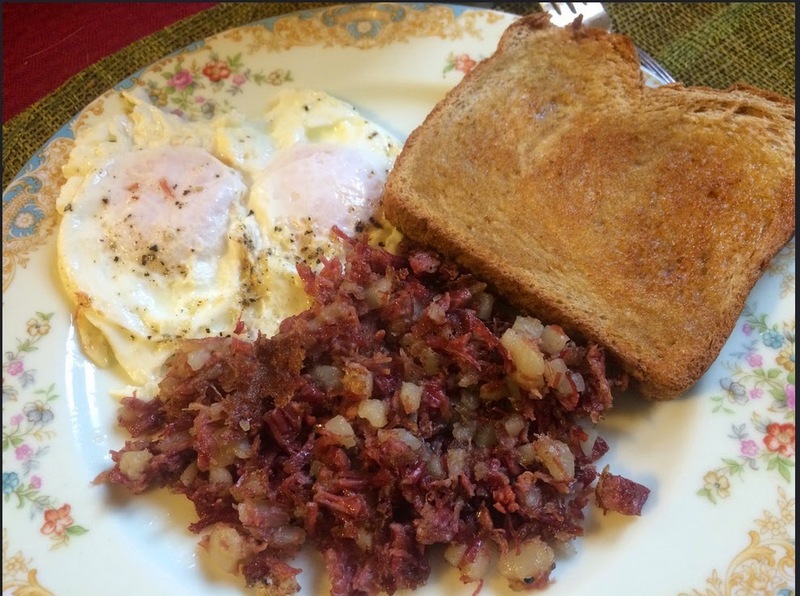 Now Corned Beef Hash in the jar from the grocery store used to be one of my favorites till I had breakfast at a little diner in downtown Santa Barbara who made homemade hash from scratch. The beef was cooked and shredded and diced potatoes, onions, and green peppers were saute with the meat till the hash was crispy on one side, just like I like it. If you can the raw meat and potatoes are cut into 1" cubes the pressure canner would do all the work and I could just drain the liquid and empty the jar onto a cutting board. Using my french knife I could dice and chop the meat and potatoes into smaller sizes and fry them up in the frying pan adding what other yummy things I wanted to add at that point. So that is what I did. Note: I didn't use the pickling seasoning that came with the meat and I peeled my potatoes. Without the pickling seasoning its just beef brisket. Here is the recipe for canning the Corned Beef and Potatoes with the Corned Beef Hash recipe following. Cut the corned beef and potatoes into 1" cubes. Fill hot sterilized pint jars with 1/4 full of potatoes and then fill to 1 1/2" headspace with Corned Beef. Add a pinch of salt and pepper if desired. Add boiling water filling to 1" headspace. Remove air bubbles with chopstick or plastic spatula. Refill to proper headspace. Wipe the rim of the jars with paper towel that has been dipped in vinegar. Add hot lid/ring and pressure can for 75 minutes at 11lbs of pressure for dial gauge and and 10 lbs for weighted for pints and 90 minutes if you are making quarts. After draining the liquid chop the potato and meat! Lynn's Breakfast Corned Beef Hash! To make the hash pour the liquid out of the jar. Empty the contents of the jar onto a cutting board and chop up the meat and potatoes into a small dice. Add a small amount of olive oil to a frying pan. If you have not added the onions previously add a 1/4 cup of diced onions per pint jar and saute till translucent. Then add the chopped meat and potatoes to the pan. Turn the heat up to medium and cook on one side for about 10 minutes. Using a spatula turn the now crispy hash over and cook for another 5 minutes. Serve with eggs and toast! The taste of the hash is great and really you are just doing a reheat. I only made 7 pints but will purchase more Corned Beef after St. Patrick's day on sale.